In just a few hours, Stride Pro Wrestling will be laying the smackdown in Woodlawn, Illinois. We're doing a fundraiser show at the grade school there. I've talked about some of the matches announced so far, here's the rest of the card and the entire show as it stands now. But as always, remember *card subject to change. JD Wilk and Ace Hawkins will team up against Joey O'Riley and Arron Brooks. This will be a phenomenal tag team match. Last week we saw the groundwork being laid for this as Wilk faced Brooks. O'Riley got involved in the finish, which saw Brooks win. Wilk came back and cost O'Riley his match for the Legacy title. Now Stride guest Ace Hawkins will get involved. This has the potential to be the match of the night. Tony Flood defends the Legacy title against Chris Hargas. This is the first time these two have battled in a Stride ring. I'm looking forward to it as well. Dexter Roswell and Brian Richards face Ax Allwardt and Jerry Travelstead. Too many bitter feelings are involved here for this to be nothing less than a fight. The monster Frank Wyatt will try to take out Heath Hatton. Woodlawn's athletic director Jan Peterson and a mystery partner will face Aaron Edwards and Nathan Brag of the DR Party. I'm sure J. Wellington Beauregard will be involved in some underhanded tactics too. 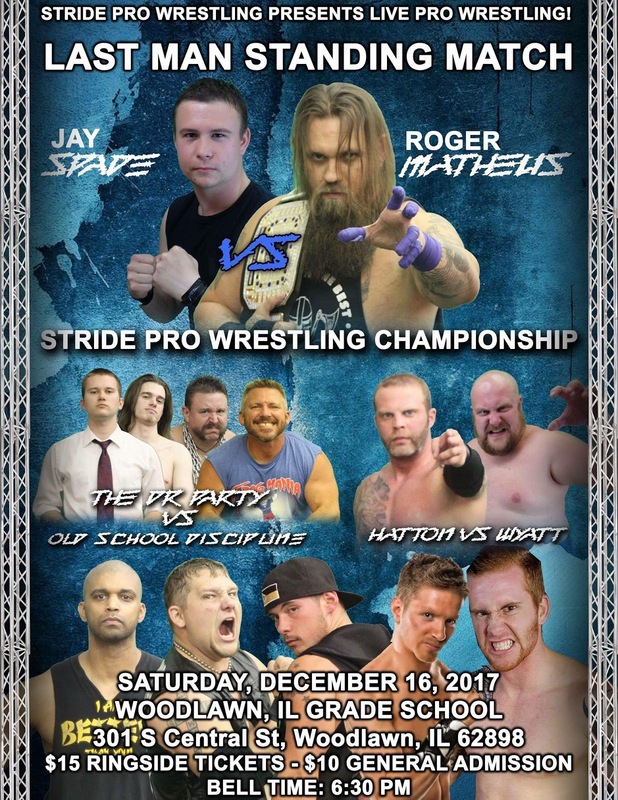 Jay Spade challenges Roger Matheus for the Stride Pro Wrestling Heavyweight Championship in a Last Man Standing match. This is the first time Stride has done such and match and I expect it will be nothing short of brutal. Remember, come out tonight to Woodlawn Grade School. Bell time is 6:30 p.m.